Like any love affair, mine started out innocently enough. Last November I was all alone in a big city for a work conference. I had some take-out Chinese food in hand and was and looking for something to distract me at night. I walked back to my room and headed to the bed. I didn’t intend for anything to happen—I really didn’t. But I grabbed the remote and, before you know it, I pulled up something I’d never watched before. 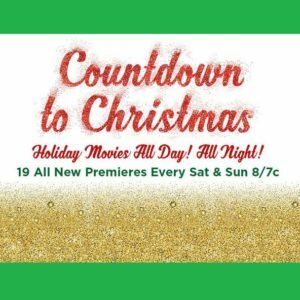 I felt a little guilty, almost embarrassed, but I turned on Hallmark’s Countdown to Christmas. 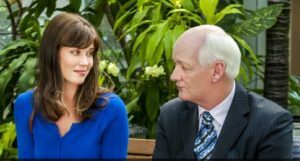 The movie playing was “Fir Crazy” staring Sara Lancaster (who I knew from “Chuck”) and Colin Mochrie (who I knew from “Who’s Line is it Anyway?”). It was charming, and cute, and yes, predictable…but oddly and surprisingly satisfying. My affair had begun. I think the movies are a “short cut” escape for me—I get a similar satisfaction from watching as I do from reading a book from my favorite romance authors—but I can wrap gifts, do online holiday shopping, fold laundry, or do whatever, while I watch. And the added bonus? With every movie (the good ones, anyway), I found myself filled with a bit more holiday spirit and a little less fried by the craziness of the season. Are you one of those who laughs at those of us Hallmark movie watchers? If you are, but you enjoy romance, romcoms, Disney movies, or Nora Roberts books, keep reading—I might just convince you to give one a try. Or if you’ve ever been curious but don’t know where to start, I can help there too. No, for real. If you like Disney princess movies, I really think you’ll like any one of these. Christmas is the backdrop for fairy tale-like romances. it worked partly because it was so unexpected. Christmas Incorporated. I liked this one, but apparently others didn’t, so maybe watch with caution. I consider all of these “modern romances” in that there’s no royalty involved, the settings are often business related, and Christmas is not necessarily a key part of the story. Don’t get me wrong—they’re Christmas movies—but like with the fairy tale ones, it’s more a backdrop rather than a key plot point and no real Santas or elves make an appearance. Charming Christmas. I’ll admit, I’m not a huge fan of the lead actor, but I enjoyed it anyway. The whole, “is he really Santa?” was done with a pretty light touch. Now, there’s a few others that are REALLY Christmasy, but I haven’t watched them. These include Northpole (and sequel) which star the likes of Tiffani Thiessen, Lori Loughlin and Dermot Mulroney. These are Christmas movies with a capital C. From other reviews, these movies seem quite polarizing (get it? Polar-izing? Ha! )—either you love them or you hate them. Proceed only if you generally like elves. Or at the very least, do not make these your first introduction to Hallmark Christmas movies—they might ruin them for you forever (which would be a shame). Ice Sculpture Christmas. Ironically, a movie about a chef but there was no chemistry between the stars and the plot fell as flat as collapsed soufflé. A Christmas Detour. Both main characters are relatively unlikeable, in my opinion. If you’re a Candace Cameron Bure fan, I’d go with a few listed above first. A Christmas Melody. Sorry, Lacey Chabert, but this wasn’t good. Honestly, it might have been Mariah Carey’s fault because she might have pipes but her acting is…well, bad. (And, really? The two of you supposedly went to high school together? Maybe only if one of you time traveled). I honestly couldn’t make it through this one. This year’s batch of new Christmas movies (all twenty of them!) started last weekend with A Wish for Christmas. I have it sitting on the DVR, but freely admit I couldn’t bring myself to watch it before Halloween. If you missed it, no worries—it’ll be on pretty much every week between now and December 25th. A Wish for Christmas: because, Lacey Chabert (did you watch it yet? Is it good?). The Mistletoe Promise: because Luke Macfarlane (who I only know from Hallmark, not “Brothers and Sisters,” but I’ve liked him in other movies). My Christmas Dream: because, Danica McKellar (from “Wonder Years”). Christmas in Homestead: because, I can’t resist a movie about a star who experiences small-town life. A Heavenly Christmas: because, Kristin Davis, Eric McCormack, AND Shirley MacLaine. I’ll admit, I probably will record pretty much all of the new movies but, in my mind, these have the most appeal so will be on the top of my watch list :-). Fellow Hallmark Christmas movie lovers, which ones are your favorites and which ones are you looking forward to the most? Feel free to drop a comment below and share. 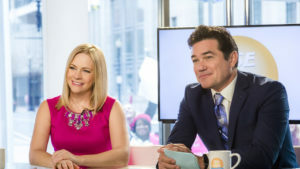 All images are courtesy of Hallmark Channel/Crown Media.